When Nouveau Cheap posts about a BIG new display that I haven't seen yet, my brain starts to itch...even if I'm not overwhelmed by what's in the display. 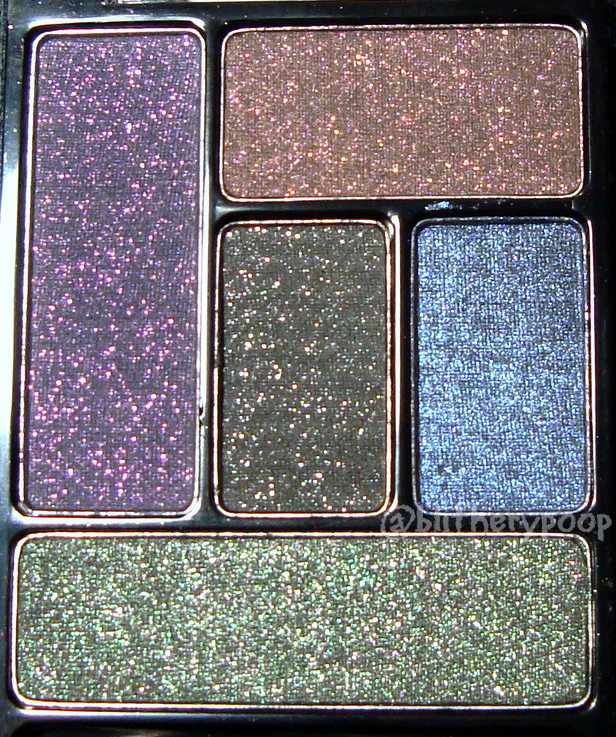 My latest itch was the Walgreens exclusive Wet n Wild Enchanted Halloween Looks display. My initial reaction was "....that's not Halloweeny at all!" My second reaction was "I don't care! I must find it!" Nichole can verify that I say contradictory things like this all of the time. It took me a while to actually track it down, but when I did there was a 5000 point reward for a $2 purchase and some of the stuff was on sale and...well....buying ensued. I posted my two polish picks a little while back, but I wound up getting a bunch of lip color and an eyeshadow palette too. I swear this isn't Cinema Glamour again. 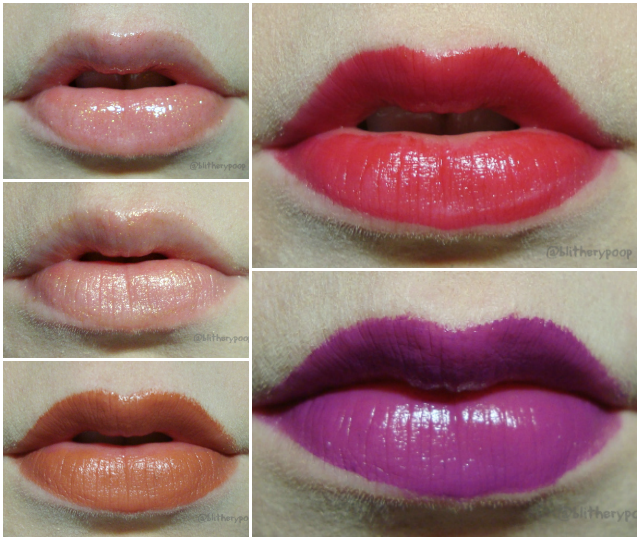 They're so similar that I actually mixed the swatches up and mislabeled the photos. Gotta admit, I'm disappointed. 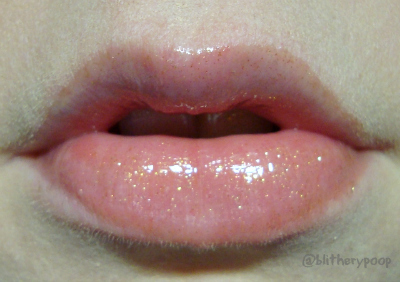 It's just shimmer with the faintest hint of color and it's slightly gritty. It might build up to more if you really worked it on, but I never like how that feels. Serious conflict here. 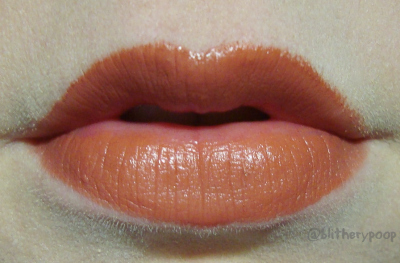 I love the color and I think it's super flattering. 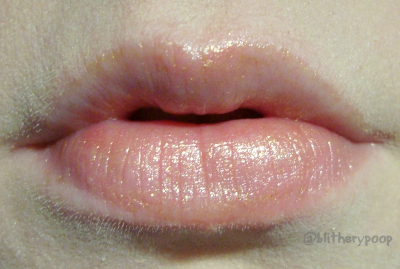 It also feels really nice and creamy on the lips. Thing is...how is this in a Halloween collection!? I'm happy to have it, but it doesn't strike me as seasonally right at all. It reminds me of a browner Rimmel Light Year. 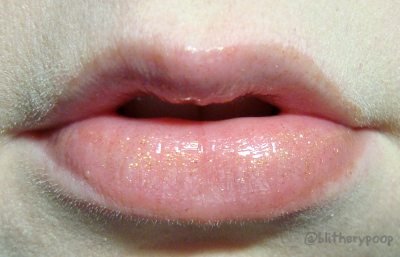 The Balm Stains are still pretty new and these two are the first I've tried. I'm really impressed with the way both of them feel and they glide on beautifully. My only gripe is that the color of the product isn't remotely close to the tube color. 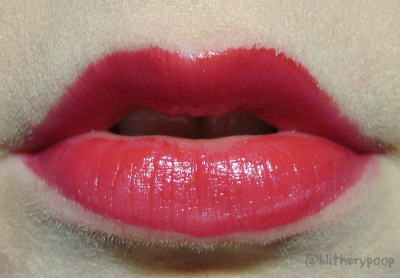 Señorita is surprisingly pink, more rose than red. Not what I expected, though I do like it. It's not Halloween-y in the slightest, but I could see myself reaching for it in the late spring/early summer. Like the name implies, it leaves a pink stain. Mistakes in application stay with you too...as you can see. Oops. The formula of this one's just as good, but the package/product difference is even stronger. 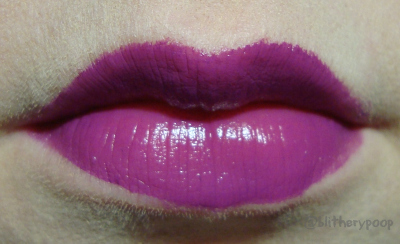 The package is a vampy purple, but on the lip it's a bright fuchsia. I love the color, but I wish they'd indicate it better. It leaves a lasting stain too, but pinker than when it's first applied. Bottom line: The Daring Downtown palette is the only really Halloweeny thing here, but Coming In Latte and 2am Call Time are both worth tracking down. Señorita is good too, though it feels more May than October to me. 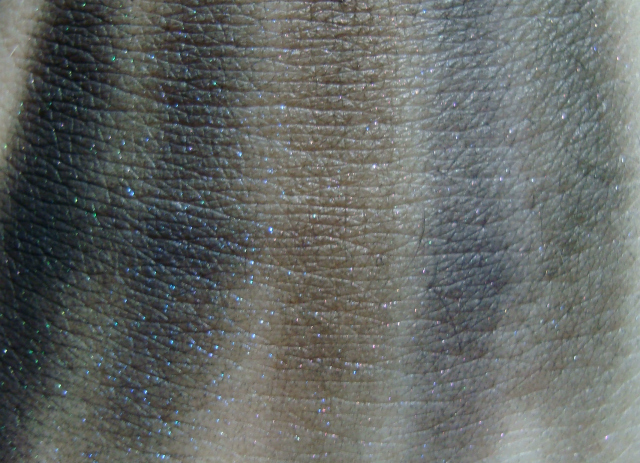 Cinema Glamour and Sunset Stripped are both barely there, but are decently sparkly. Did you get anything from this big, confusing display? Am I too much of a diehard or is the spooky seasonal spirit really lacking here?